San Diego County Crime Stoppers and investigators from the Metro Arson Strike Team (MAST) are asking assistance from the public to help identify and locate the suspect who is responsible for a vehicle fire, which took place in the parking lot of the Iris Trolley Station located at 3120 Iris Avenue, in San Diego. On Friday, August 3, 2018, at about 8:30 a.m., an unidentified suspect was captured on video surveillance entering a yellow Ford Mustang while parked at the Iris Trolley Station. The suspect started a fire inside the vehicle and walked away. Anyone with information on the identity or location of the suspect is asked to call the Metro Arson Strike Team at (619) 236-6815 or the Crime Stoppers anonymous tip line at (888) 580-8477. Crime Stoppers is offering up to a $1,000 reward to anyone with information that leads to an arrest in this case. Visit the Crime Stoppers website at www.sdcrimestoppers.org for more information on how to send anonymous web and mobile app tips. Media inquiries about this case can be directed to Sgt. Rick Pechin at (619) 236-7765 or email at rpechin@pd.sandiego.gov . 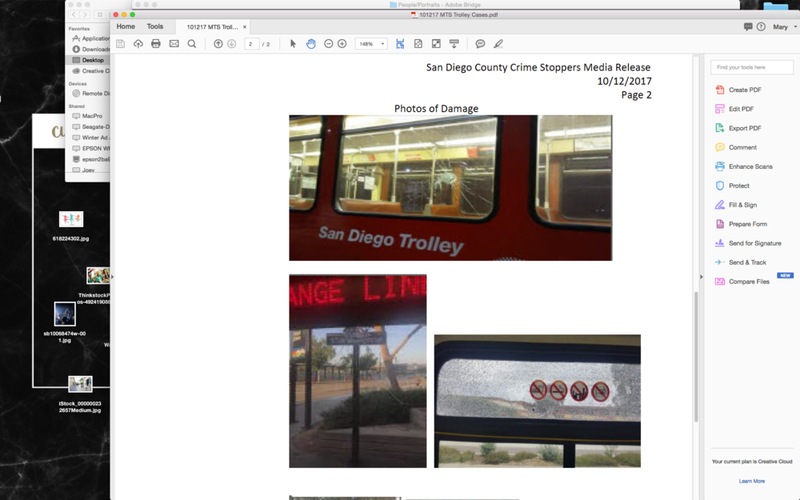 San Diego County Crime Stoppers and investigators from the San Diego Police Department’s Southeastern Division are asking for the public’s help in identifying and locating the suspects responsible for throwing objects at moving MTS trolley cars at various locations throughout Southeastern San Diego. The most recent cases have occurred at the 54th Street pedestrian crossing near 54th Street and Market Street (Valencia Park area). In all of these cases, one or more suspects are seen throwing large rocks at moving trolley cars causing a large amount of damage to the exterior of the trolley cars. This damage includes cracked windshields, side windows, broken lights, and dented exteriors. The total damage in all of these cases is over $ 40,000. Investigators would like to remind the public that throwing objects at a trolley is a felony crime in addition to the vandalism those objects cause. Objects being thrown at the trolley have the possibility of breaking through the glass and causing serious injuries to both the driver and passengers onboard. Anyone with information on the identity or location of the person(s) responsible for these crimes is asked to call SDPD’s Southeastern Division at (619) 527-3500 or the Crime Stoppers anonymous tip line at (888) 580-8477. Please visit www.sdcrimestoppers.org for information on how to send a web or mobile app tip. Crime Stoppers is offering up to a $1,000 reward to anyone with information that leads to an arrest in this case. Inquiries about Crime Stoppers can be directed to SDPD Officer Mark Herring at (619) 531-1500 or msherring@pd.sandiego.gov or Deputy Adriana Uribe at (619) 531-1547 or email at adriana.uribe@sdsheriff.org . Eduardo Aguilar is wanted by the San Diego Fugitive Task Force for an outstanding felony warrant ($ 250,000) for his arrest. The warrant is for felon in possession of a firearm and possession of ammunition. Aguilar has multiple previous convictions for vandalism. Aguilar is known to frequent the North County area. Abel Abrego is wanted by the San Diego Fugitive Task Force for two outstanding felony warrants for his arrest. One of the warrants is for assault with a deadly weapon ($ 200,000) and the other is for vandalism (no bail). Abrego is known to frequent the North County area. San Diego County Crime Stoppers and investigators from the San Diego Police Department’s Northern Division are asking for assistance from the public to help identify and locate an unknown male suspect wanted for vehicle burglary and vandalism. Detectives said on October 16, 2013, at approximately 4:45 p.m., an unknown male suspect broke the rear window and stole a purse, which included a wallet with multiple credit cards, from an unoccupied vehicle. The vehicle was parked in the parking lot of the Coggan Aquatic Center located on the corner of Fay Avenue and Nautilus Street in La Jolla, CA. The suspect attempted to break into another vehicle at the same time and location but only managed to damage the vehicle window. The suspect used the stolen credit cards at various stores in and around La Jolla as well as Oceanside CA. Anyone with information on this case should call SDPD Northern Division Detective Gregg Goodman at (619) 552-1733 or the Crime Stoppers anonymous tip line at (888) 580-8477. Crime Stoppers is offering up to a $1,000 reward to anyone with information that leads to an arrest in this case. Anonymous email and text messages can be sent in via www.sdcrimestoppers.com.